Copal shutter with B, 1/4 sec. to 1/500 sec., X-sync. Built-in self-timer. Hot shoe and PC socket. Coincidence rangefinder integrated with reversed Galilean viewfinder. Automatic parallax correction with projected frames and marked finder. 0.6x magnification. On the right within the image area are the aperture scale, meter needle, overexposure and underexposure warnings. Exposure Meter and EE: CdS cell for shutter speed-priority EE. Metering range of EV 3.5 - 17 (at ISO 100). Film speed range of ISO 25 - 800. Manual exposure enabled by disabling AUTO. Uses standard 35mm film, producing 24 x 36 mm exposures. Film Loading & Advance: After opening camera back, align film leader at mark then advance to first frame with Quick Loading (QL) system. 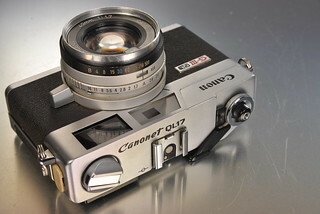 Advances with camera-top lever's 127° single stroke. Partial strokes not enabled. Film transport confirmation window provided. Power Source: One 1.3 V H-D mercury cell. Battery check provided with a lamp.